The weekend is finally here (yay!) this week went a little too slow for me! Today I’m SO excited because two new summer arrivals hit the Rachel Parcell site this morning!!! Both styles are PERFECT for all of the fourth of July festivities that are coming up! Be sure to order on or before Monday, June 27th to make sure they arrive in time! So technically this dress is not maternity, but I was bound and determined to squeeze my massive tummy into it. Sorry if it looks a little awkward on me, but I promise on a non-prego body it looks AMAZING (and hits a little longer) it’s so flattering on every figure! A chambray dress is such a classic piece to add to your wardrobe (I have about 5 different styles in my closet) and it’s a great transition piece into fall as well. I hope you love it!! Totally loving the pop of red!! <3 and those Jeffrey Campbell lace up heels are super cute! Great pieces! Just checked out the site. Like the summer feel to it. Love this casual glam! I think it’s great that your collection includes sophisticated casual wear as well as more dressy items too! So fab!!! How cute is this shirtdress?! Love it! what a gorgeous look! Love the red bag! Love this look – perfect for the 4th of July! Great dress! And I love those fab heels. super cute dress! and looooove those shoes! You look SO pretty! Love these red accessories. Such a cute dress! I’m also pregnant (28 weeks) and I’m curious what size you are wearing in this dress if you don’t mind sharing that! I love the way the chambray plays off the red too! Definitely the perfect look for you! The dress is lovely, perfect for your state and you look fantastic with the red JC heels. Have a lovely weekend. so so perfect!! agh!! I am so happy you have started your own line!! Congrats girl! Hope you have a great weekend love! Stunning, Rachel! You have the cutest bump! That red Chloe Drew is the bag of my dreams and it look fabulous on you! Love the red accents in this outfit! Love this dress. I think it looks great on you for maternity. I’m 23 weeks and wondering if I could make it work too. Would you recommend sizing up to accommodate bump/baby weight? I couldn’t get the size chart to work on the website. Thanks!! Hi Stephanie! Yes I would recommend sizing up a few sizes just for the bump! Also so excited for you and your little one! That dress is really cute! I love the red accessories! I love that dress! The design is very simple and I love that! It’s the perfect everyday dress! Such a cute outfit! I love anything chambray and this dress is perfect. The pops of red are beautiful! Such a cute dress… and those Jeffrey Campbells are to die for!! 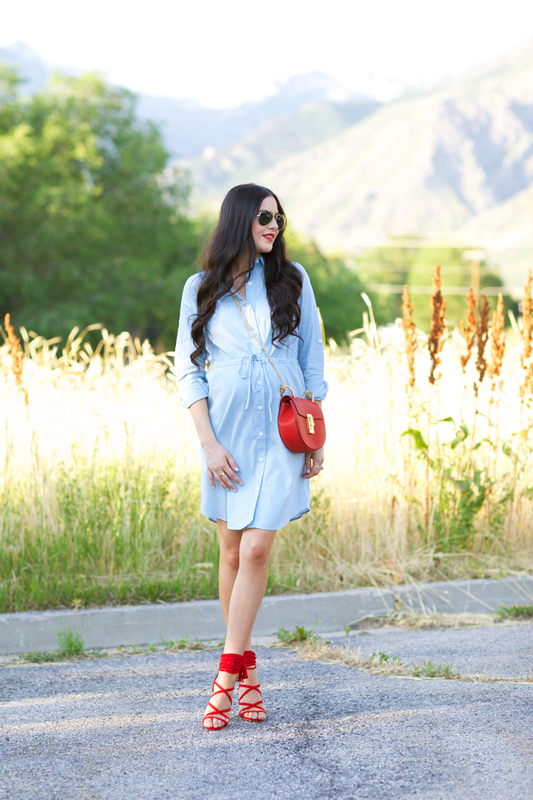 Chambray dresses are SO CLASSIC! Everybody must own one :) I love yours! Congrats again on your amazing collection! I love how you matched the red heels with the red bag. It really takes this look to another level. LOVE the red bag with the red shoes! So gorgeous! I love this chambray! Looks comfy! Totally loving it!! Love the new site for the collection as well. Gorgeous!! 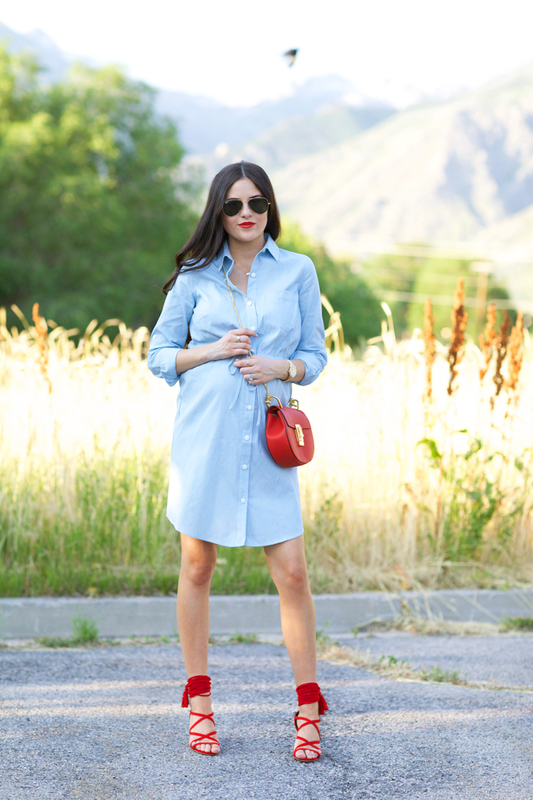 Absolutely love this button-up chambray dress. Rachel, you always know how to pull an outfit together! Designing is definitely your calling! Oh my gosh Lauren Thank you so much! Im so happy I get to design stuff for you guys! The dress looks great on you! And I’m obsessed with the shoes!! So pretty! Aaaaah I love this look! The shoes and bag are perfect! I love this!! Your chambray and red looks so chic, and not in the obvious 4th of July way – very unexpectedly cute! in love with this look! and the pop of red is just perfect with it! Beautiful look! Love the dress girl. Those Jeffrey Campbell lace-up sandals are so cute!! They pair so perfectly with your new shirt-dress! Also, I think this might be my new favorite piece that you have come with so far :) It is so cute and classy! Hi Jordan!! Thanks so much you are the sweetest! I love how the shoes add a pop of that perfect color! Im so happy you love the dress and its really so comfortable too! The dress does not look awkward on your belly. It’s cute! So stunning look beautiful dress,bag,heals,watch. You look so pretty! Love the pop of red. That dress is so cute and versatile! LOVE! 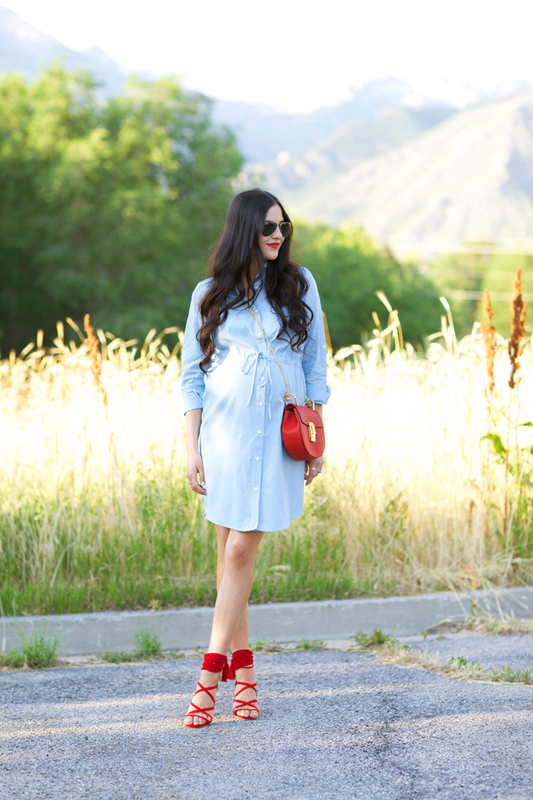 I am loving this red and chambray combo!! So cute! And those shoes are too perfect! This dress looks amazing on you still. I love your blog! very nice :) Check out my latest post to shop my first collab. 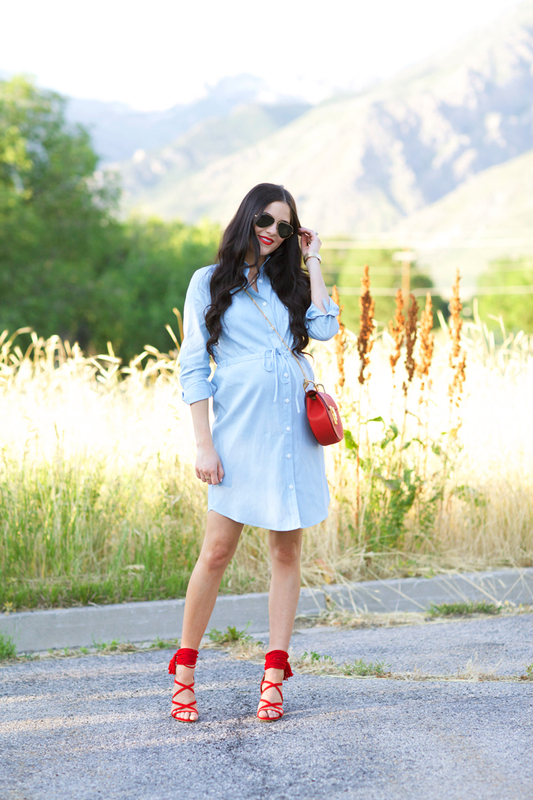 Hello, I’m pregnant and really love this denim Rachel parcel dress. Im trying to figure out the right size. I’ll be 5-8 months pregnant over the spring/summer months when I would wear this. I’m usually a medium, would you suggest a Large or XL. I’m a first time pregnant woman so I’m still trying to figure it all out ?